From 10 May to 30 June, in Rome, for the second consecutive year, the Draftsmen’s Congress becomes a place in which artists and audience establish a dialogue, using the language of images rather than that of words. Everyone is encouraged to take part in the discussion, by drawing, painting or using other traditional materials and techniques, in a free response to the urgent issues of our time. The Second Draftsmen’s Congress begins on Friday May 10th at 18.30 at the headquarters of the Swiss Institute in Rome – via Liguria 20. Initiated by Paweł Althamer at the church of St. Elisabeth in Berlin Mitte and at the ISR in Rome, in the context of the 7th Berlin Biennial, the Draftsmen’s Congress is the space in which everyone is urged to enter into a free dialogue of imagery: participants can be polite or politically incorrect, frustrated or indignant, and can intervene on the drawings of others in a true encounter and clash of images. Images that love or hate each other, opinions that can be shared, demands that can be made. The complexity of the forms and actions triggered by the 2012 edition of the Draftsmen’s Congress has led to a multiple, indefinite narrative. This second edition sets out to test the approach again, expanding it into other experiences, techniques and areas of knowledge. You are all invited to draw. 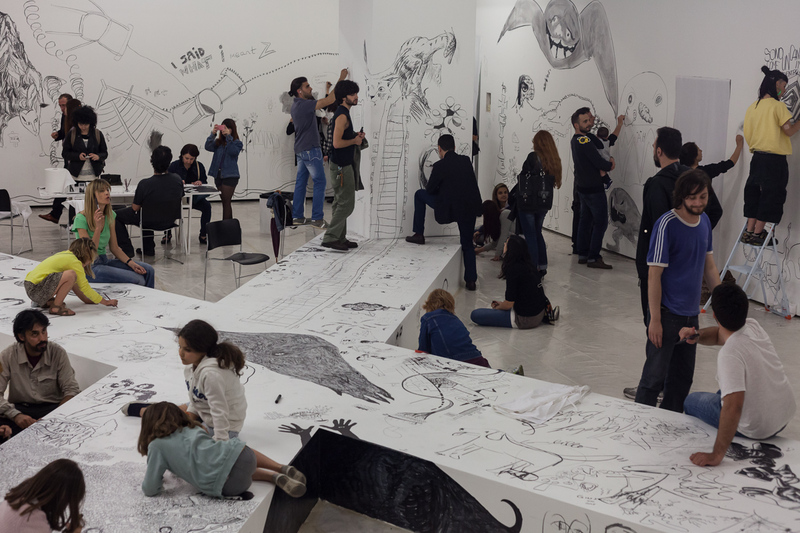 For this second Congress in Rome, the headquarters of the Swiss Institute is the central site of the event, which will also spread into other places in the city: the studio of the artists Matteo Nasini and Nicola Pecoraro, in the Magliana neighborhood; the RSI factory occupied by workers in February 2012, in the Portonaccio zone; and other places as well. Physical sites, but also allegories of a path of retracing of the cultural map of the city of Rome, where the past and present coexist, where new energies meet on the solid foundation of difference. The Congress will be enlivened by workshops that will involve many of the protagonists of the activities ISR has developed over the course of the last year – encounters generated starting with the experiences of the Draftsmen’s Congress of 2012 – coming together for this second edition on a territory that is to some extent inaccessible or in any case unusual for many of them: jurists, neuroscientists, philosophers of language, architects, students, children, teachers, artists, workers, artisans, political activists and philosophers, physicists and musicians. For the Congress in Rome, the Draftsmen’s Fest that took place at the Milan facility of ISR in the spring will also be reprised.